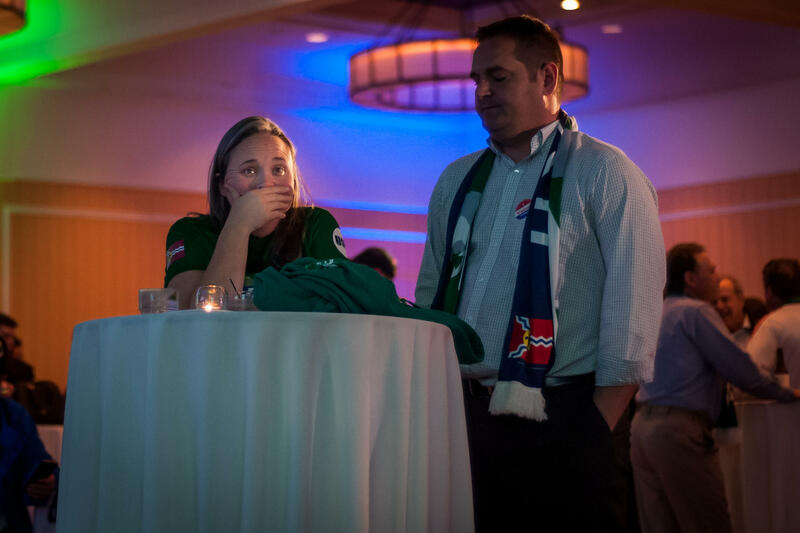 Lauren Rapp, from St. Louis, watches Proposition 2 election results with Bo Thomas. A bid to publicly fund a soccer stadium failed to pass Tuesday. Proposition 1 puts the half-cent sales tax increase will go toward expanding public transportation and providing public safety equipment; the tax increase that businesses pay on out-of-state purchases will go toward affordable housing, public safety and public health. The proposition passed with 60.39 percent of the vote. But Prop 2, which about 53 percent of voters rejected, would have directed that use tax increase — about $50 million — toward the stadium’s construction; up to $10 million from the sales tax increase could have been put there, too. Hundreds of thousands of dollars in advertising and visits by national soccer figures didn’t sway St. Louis voters, who again made it clear Tuesday they don’t want taxpayer money to be poured into a professional sports stadium. 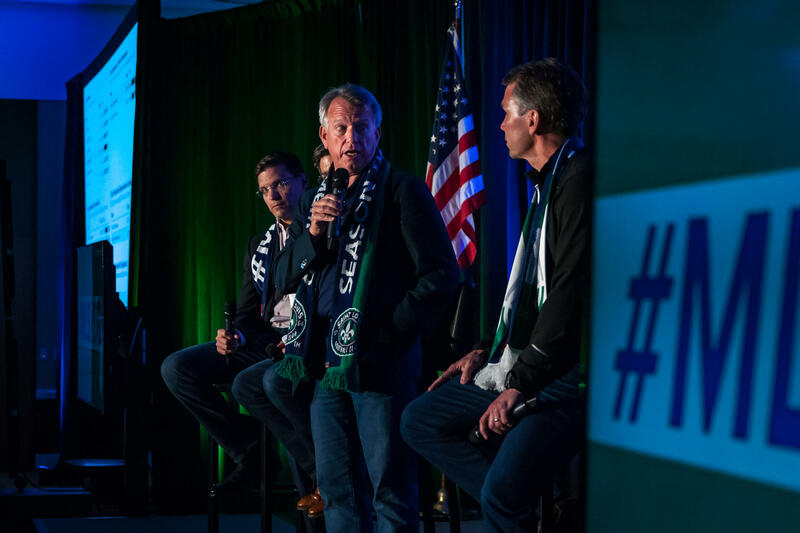 "We didn't end up accomplishing what we wanted," said Jim Kavanaugh, the vice chairman of the ownership group, SC STL. "Take it as a great experience, not a great result." SC STL chairman Paul Edgerley said people "worked hard" and that the group was "disappointed for St. Louis." Speaking with reporters after the results came in, Kavanaugh said Prop 2's failure was effectively a death knell for St. Louis' chances for a MLS team. The city is competing with 11 other cities for four MLS expansion franchises. SC STL chairman Paul Edgerly, center, speaks to supporters after Proposition 2’s defeat Tuesday night along with the rest of the investor group at Union Station. Opponents had argued the stadium shouldn’t be a priority for a city facing economic and public safety issues, and that a team wasn’t likely to benefit residents in struggling neighborhoods. The rejection also comes after the city’s Board of Aldermen didn’t bother putting up to public vote a plan to build a riverfront stadium for the now-departed St. Louis Rams, knowing the support wasn’t there. Alderman Megan Green also questioned whether public financing was truly necessary. The 15th Ward Democrat noted that members of SC STL are all individually wealthy and could have come up with the $60 million themselves. SC STL had purchased TV, billboard and direct-mail advertisements for the ballot measures. And the city and SC STL had signed a community benefit agreement, instituting minority hiring programs and youth soccer initiatives. Opponents spent little money against Proposition 2. But a number of prominent officials and Democratic activists, including St. Louis Treasurer Tishaura Jones, vocally opposed the measure.